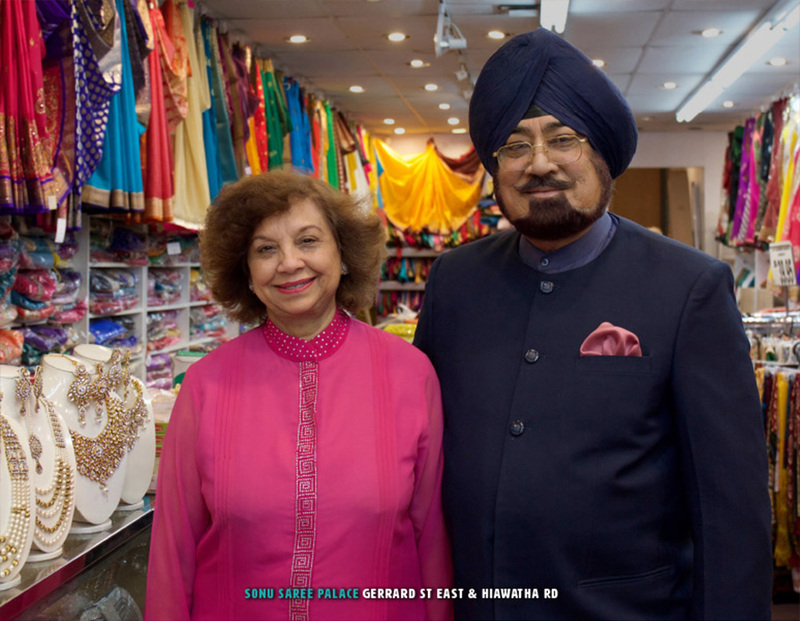 Inder Jandoo came to Canada in 1970 from New Delhi, India and was joined by his wife, Bhupinder in 1972. At first Mr. Jandoo found work as a general labourer and then he joined Sun Life Canada as an Insurance Salesman. In 1979 the Jandoos opened Sonu Saree Palace in a rented 200 sq. foot location. They were one of the first Indian businesses to arrive on Gerrard St East, drawn by the large South Asian crowds that flocked to the Naaz Theatre, North America’s first exclusively Hindu-Pakistani language movie theatre. The business moved to their current location 1980. They bought their building in 1981 and then the adjacent building in 1985, and they expanded to their present store size in 1995. Sonu Saree Palace carries silk and polyester sarees, ladies, men’s, girls and boys ethnic and fashion wear, costume jewellery, ladies party shoes, men’s ethnic mojri shoes, fancy and plain fabrics and much more.